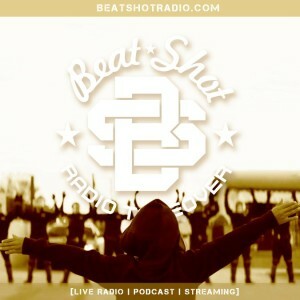 ★Guest Host: Rapper/beatboxer/producer Emcee Graffiti! ★Red Lobster And Hot Sauce: Are conscious Black activists allowed to love Beyoncé’s new #Formation video? Or did the era of enjoying radical popular music die with the James Brown and the “I’m Black And I’m Proud” generation? Also, can non-revolutionary artists ever speak on their own experiences with Blackness? We discuss. ★EXCLUSIVE Kathy Sheehan “Interview”: The recent @Jamz963 interview with the mayor left many questions unanswered, so we decided to interview her ourselves. But how?! ★Passing Out: Do you remember the first time you lost consciousness? We relive the circumstances surrounding times we’ve literally blacked out. Tweet yours to @BeatShotRadio #BlackOut. ★Political Football: This year’s Super Bowl was shrouded in racial tension and politics. Keeping in mind the NFL is, above all else, an evil entity, we examine some of the ways sports (including Super Bowl 50) have helped and harmed social movements. ★Halftime Trivia: Finally, a chance to put all the information gained from watching Super Bowl halftime shows to the test. ★Struggle Food: A candid discussion of questionable things we’ve eaten because we were either too broke or too uninspired to find something worth consuming. Tweet yours to @BeatShotRadio #StruggleFood. Also, remember you can donate individually wrapped sandwiches or portable snacks to the Homeless Action Committee @ 393 N. Pearl St in Albany.